Hello Crafty Friends! Just poppin' in to show off these super cute, super quick, and super easy gifts in a jar! I made these super simple and very pocket friendly bath salts. I made a few of these for teacher's gifts for my girl's last day of school before they went on winter break. You can find more info here from a previous post. I packaged my salts in simple glass jars I bought from my local dollar store. Wrapped the base of the neck with this adorable stitched grosgrain. And, tied cute handmade gift tags to each. 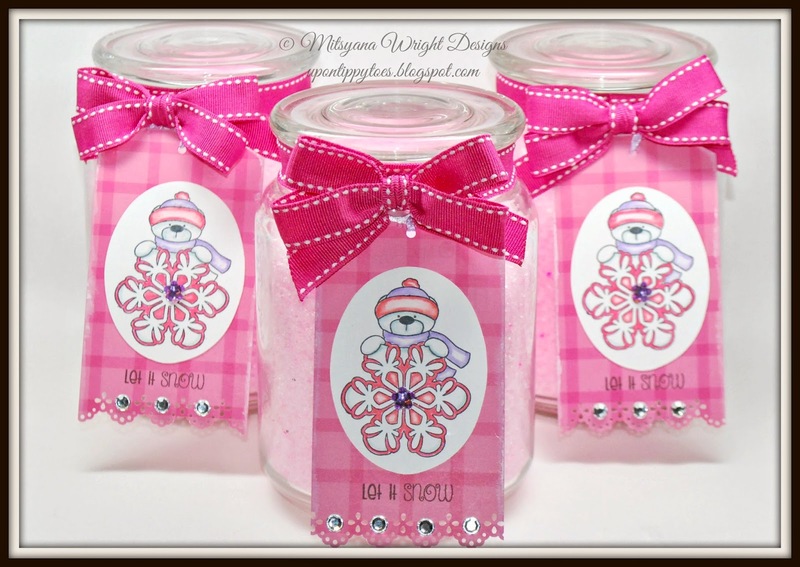 To make these super cute tags I used Pink and Main's Frosty Friends and Snow Globe stamp sets. And for the cute scalloped edge on the bottom of the tag I used Martha Stewart's Eyelet Lace border punch. Then I added bling to the centers of each snowflake as well as in between each scallop. I love the pink! You sure can tie a bow. I'm jealous! The teachers will love and appreciate this gift. Hope you had a very Merry Christmas and have a fantastic New year as well! !